Driving for the one-car Rahal Letterman Lanigan team, Graham Rahal may be IndyCar's unlikely 2015 champion. There is no implement in sports quite like a racing helmet. It shields but it also reveals, especially on the IndyCar circuit. It is one paradox that stems from another: cars that are roofless yet completely covered—in shimmering paint schemes, in bold-faced sponsor decals, in a chorus of engine roar. At 200 miles per hour only the driver’s head, which juts out like a Pez dispenser top, cuts through. Yet his mannerisms, his emotions, his personality stay under the dome. The helmet becomes a canvas for self-expression. It’s how Graham Rahal stands out. 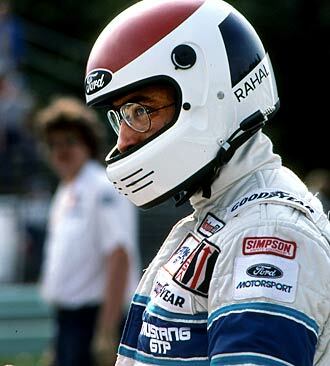 Rahal chose the color scheme to announce his American roots, which trace to Columbus, Ohio. The red top is callback to one that once adorned the helmet worn by his 62-year-old father, Bobby—the bald, mustachioed wonk who ruled open wheel racing in the ’80s. In fact, the whole production is meant as an homage of sorts to the three-time CART champion—one the old man still can’t quite see for all his squinting. “His helmet looks nothing like mine,” Bobby says with a chuckle. The bigger, bolder lines that surround Rahal’s helmet may have something to do with that. They suggest a man on the move—a fairly accurate representation of Rahal these days. He enters Sunday’s race at Pocono, the penultimate on the IndyCar schedule (2 p.m. Eastern on NBCSN), ranked second in the standings—a mere nine points behind Team Penske’s Juan Pablo Montoya. That Rahal is even that close to the championship is absurd. Rahal races for the league’s most celebrated underdog—Rahal Letterman Lanigan, a team with three owners (his father, former Late Show host David Letterman, and construction building equipment magnate Mike Lanigan) and one car. What’s more, that car was brought to them by Honda—the manufacturer that has had the hardest time adapting to IndyCar’s new aero package. 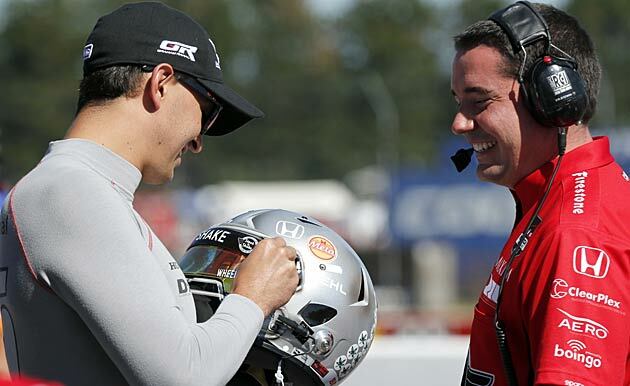 Yet here Rahal is anyway with six podium appearances in 14 races (including a pair of wins at Fontana on June 27 and in the most recent IndyCar contest at Mid-Ohio on Aug. 4), butting into what was supposed to be a title prize fight between the heavyweight franchises of Penske and Ganassi. If Rahal were to pull off the upset—a prospect made all the juicier by his finishing average (7.0), which ranks highest among the drivers in the top five; and a double points IndyCar season finale in Sonoma, Calif., on Aug. 30—it wouldn’t just be a sweet reward for seven years of misspent ambition. It would make Bobby and Graham the third father-son duo—behind the Unsers (Bobby Sr. and Jr.) and the Andrettis (Mario and Michael)—to claim a major American open-wheel championship. “That would be something, wouldn’t it?” says Bobby. Interestingly, he never intended for his son to follow him this far into racing. Still, that’s not to say he didn’t think it possible from the moment he gave Graham his first helmet. That was in the 1990s—a simpler time for helmet design, says Bobby. His was typical of the no-frills era: a white shell, a blue wraparound trapezoid, the red top. The statement it was meant to make about him, he says, “was that I was an American because I was racing all over the world.” The lid he’d give to his boy was essentially a scale replica. Today it sits on a bookshelf in Graham’s Indianapolis home office. Looking at it, surrounded on the neighboring shelves by Graham’s other spent racing jars, you wouldn’t necessarily know that this helmet, too, is symbolic—that Graham has essentially been fighting for that thing since he was three. Bobby knew the dangers over the horizon. The largest in his view was the family name, which would trail in Graham’s wake like a cement spoiler. While Bobby himself had never carried such a burden—his father, Mike, was a capable amateur sports car racer, but no mythological figure—he nonetheless had competed against enough sons of greats to grasp just what a drag a family legacy can be. Somewhere around Graham’s sixth birthday, Bobby finally caved and gave Graham that red, white and blue bookshelf ornament—but on one condition: he had to make high grades in school to keep it. So Graham hustled—hard—all the way through high school at New Albany in Ohio. He graduated in 2007 “with a 3.8 GPA” he says proudly, after missing 80 days of senior year to scale the minor league ladder. What you won’t find on his transcript, however, are the credits he received from the School of Hard Knocks. Next generation racers aren’t supposed to struggle. They’re supposed to cruise from one success to the next on a road paved by the sweat of their forebears, a road so safe they could almost navigate without a helmet. There was no chance Bobby was going to allow Graham access to this road, not after working so hard to make his own breaks. And even after Bobby landed his biggest in the early-80s, when Red Roof Inn founder Jim Trueman tapped him for his expansion IndyCar outfit, Bobby still had to come up with half the funding. So it was with Graham. At age 10 the kid started drafting sponsorship letters to fund his exploits. “I'm in my room on my bright orange colored Mac,” Graham recalls, “asking for, like, $200.” The effort, which saw the zeros increase over time as his results in national competitions improved, got him all the way to Champ Car in the spring of 2007. At age 18 he scored a seat with the blue blood outfit of Newman Haas Lanigan (the same Lanigan who is now partnered with Bobby), racing alongside Sébastien Bourdais—an IndyCar vet who, back then, was working on his fourth straight series title. In 14 starts Graham reached the podium four times—including second place in his third race—on the way to finishing the season fifth in points. Graham’s problem was that, despite his obvious gifts as a wheelman, he could not marshal consistency. That’s no crime for a young driver. For the son of a great, however, it’s bloody larceny. In the 15 races following his seismic debut at St. Pete, Graham posted seven DNFs. The next year he trended toward a breakthrough, scoring two poles (at St. Pete and Kansas), two podiums (at Richmond and in Motegi City, Japan) and coming within the final race of climbing into the top five in the standings. (He wound up seventh.) Just when it looked like that breakthrough might take a little while longer, until 2010 perhaps, his principal sponsor, McDonald’s, pulled funding—effectively making Graham a driver-for-hire. He raced for four teams—including his dad’s in the Indy 500, placing 12th. His two starts prior had both ended in crashes. Even more striking than where Graham is finishing this year (which, again, is 7.0 on average) is where he’s starting—11.8, which is far and away the worst mark of the drivers in the top five. That he’s managed to close that gap anyway is a testament to his good fortune and to the unwavering belief that, somehow, his squad will get his Honda to the front. For his June 27 victory on Fontana’s two-mile oval, it seemed as if Lady Luck had called shotgun. During a third-quarter pit stop, Graham peeled out of his stall as one of his crewmembers was topping off his car. In the exchange the nozzle was severed from the hose, which Graham carried from pit lane onto the track. A yellow quickly emerged, and Graham was forced to circle back around for another servicing. The botched stop swung his track positioning from second to 17th. But he’d rally over the next 60-odd laps on the way to snapping a 125-race losing streak. Most assumed IndyCar would punish Graham for the gaffe the following week, either by docking him points or by voiding his win. IndyCar spokesman Mike Kitchel says race officials “did not immediately see a proper view of the entire incident.” Instead of an in-competition penalty, which a better officiating perspective might’ve brought, Graham was fined $5,000 and his fueler placed on probation. Three races later at Mid-Ohio—essentially, his hometown race—Graham caught another huge break. Stuck with a 13th-place qualifying position (a terrible lot on this twisting, undulating 2.3-mile road course, where passing is especially challenging) after being held up by Sage Karam, Graham and crew elected to go with an off-sequence pit strategy to regain higher track positioning. On one of those stops—again, at the three-quarter mark—he entered the pits just as Karam spun out. When Graham merged back onto the track, he heard Nault say over the radio: “Everybody in front of you has to pit. You don’t. You’re the leader effectively when this thing goes green.” And there Graham effectively remained until the checkered flag flew. As he rolled to a stop just off his pit box, before a throng of giddy onlookers, Graham pumped his right fist in the air and unbuckled his helmet—which, for this race, he had rendered into a facsimile of an Ohio State football helmet. It was a brilliant work of art, complete with a facemask and 18 buckeyes on the back—for Graham’s career podium appearances to that point. His son means no disrespect. It’s just that there are some things he simply cannot be talked out of. Add the idea that he can’t get to the top of the table at season’s end to the pile. 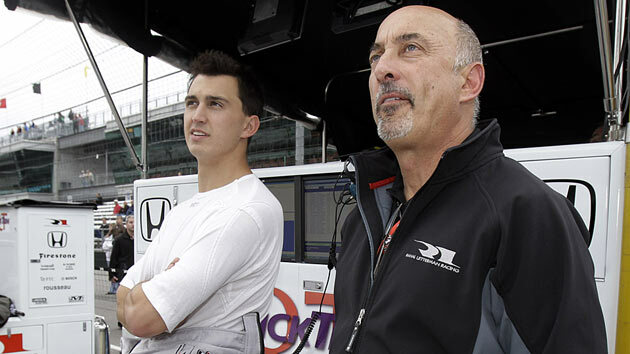 “It’d be a cool thing to put the Rahal name right there with those other two father-son champion pairs when you think about names of the sport,” he says. Certainly, there’d be no doubt about what to make of his name anymore.